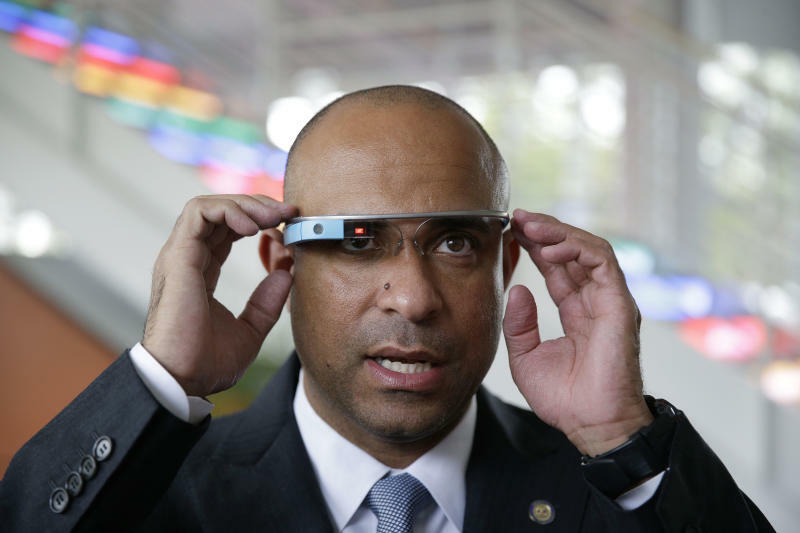 MOUNTAIN VIEW, Calif. (AP) -- From Google to Facebook to Apple, Haiti's Prime Minister Laurent Lamothe took a whirlwind tour through Silicon Valley's most elite tech firms, persuading some of the world's wealthiest and most successful corporate executives to share support and innovation with the poorest country in the Americas. "Oh cool!" he said Wednesday, slipping on Google Glass — Internet-connected eyeglasses — at Google Inc.'s headquarters before a cruise in the company's driverless car. Lamothe joins a growing stream of politicians, celebrities and CEOs taking these popular roadshows where they do a little business, a little schmoozing and quite a bit of questioning about how technology can change lives. "Even if we do need water, we need the technology to know the areas where we have issues with water supply in order to create a better inventory," he said. "Technology can help us bridge the development barrier we have today." If there was an opposite of the affluent Silicon Valley, where entire municipalities have free Wi-Fi, it could be impoverished Haiti, where fewer than 1 percent of Haitians are regularly online. But worlds collided in a conference room at Facebook when Lamothe jumped into a question-and-answer session and watched hundreds of Haitians' questions pour in. When Jean Amos Bonhomme, a father of two who lost his home in a devastating 2010 earthquake, typed in that he needs a job and included his phone number, Lamothe shocked the man by calling him directly and asking what his skills were. Bonhomme said he's a teacher and an accountant, and speaks English. Lamothe told an aide to set up an interview. "These are the enjoyable times for being prime minister," said Lamothe, "when I can make a direct difference in a person's life." Although Haiti lacks much infrastructure, there are Internet cafes throughout the capital Port au Prince, and cellphone use is leapfrogging landlines. Some of the millions of dollars of earthquake relief and recovery aid has been spent on trying to get the country wired, including a $3.9 million program launched this fall to deploy 65 miles of optical fiber in the country's southern region. On Wednesday, Lamothe was sharing his vision for an even more wired Haiti, which begins with gathering data, from mapping all of the health clinics to conducting a census-like count of the population. The country has no ZIP codes and would like to replace its mail address system, which includes mentioning proximity to mango trees or intersections, with geolocation. At Google, executives agreed to Lamothe's request to get updated satellite images for Google Earth. Last updated after the earthquake, hundreds of thousands of tents are no longer there, and many new buildings have gone up. Google also committed to sending servers to Haitian Internet providers that will cache information, and the tech giant re-upped its donation of a package of online services that provide email and other services for more than 3,000 government employees, a benefit that usually costs $50 per person. At Facebook, he tried out a new app designed especially for political leaders to be closer to their constituents; he liked it, and on Monday after it's installed, he plans to be the first head of state to use it. While this was Lamothe's first visit to the tech titans, the Prince of Asturias made the rounds just last week and South Korea's ambassador to the United States, Ahn Ho-young, swung through in August. The campuses are varied and impressive, with unusual features from Google's bowling alley to a small Wizard of Oz mock-up of Dorothy's house at Facebook, complete with smashed witch legs. "These businesses have a very progressive culture, one that understands that investing in the employees will pay great dividends," Lamothe said. "They take care of everything — free meals and free snacks — and that leads to being able to get maximum productivity."